Home Camping Spots Is There Anything Better than Camping on the Beach? When it comes to outdoor activities and vacations, the 2 most popular things that people like to do are going to the beach and going camping with their friends. The only thing that can beat both of those fun adventures is deciding to go camping on the beach. When you combine both of these amazing activities into one, you get a fun filled vacation that will be talked about for many years to come. Most people have probably never thought about the idea of camping on the beach because the idea is rather barbaric and unique. Everyone loves to get out on the beach during the summer months, but not many people are willing to sleep out there at night as well. There is nothing wrong with deciding to camp on the beach because the waters are actually quite peaceful at night. One thing that you should not do when you decide to camp on the beach is go swimming at night because it’s hard to stay safe in the ocean when you can’t really see anything. It’s extremely dangerous to get caught out in the water when everyone else is asleep, so you need to be careful about what you are doing out there. Walking along the water and getting your feet wet is obviously fine, but you don’t want to really dive in once the sun has gone down for the evening. Camping on the beach is always a great decision because there is nothing better to do at night while you are near the ocean. When you camp on the beach, you get an entirely new appreciation for the ocean and how beautiful this world really is for everyone. You also get to go to sleep to the sound of the waves crashing up against the shoreline. You need to be careful about where you are sleeping on the beach because the tide will come in at a certain point in the day. Try to sleep rather far away from the water because you don’t want to be woken up by waves crashing up against your body. 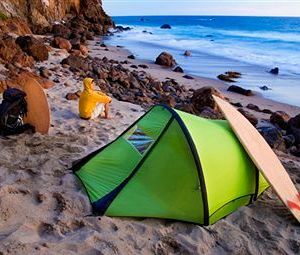 As long as you take all of the proper precautions, you should have a wonderful time with your camping trip on the beach. You should try to get some friends together if you are interested in camping on the beach because there are many different locations around the world that allow this kind of activity. Whether you want to visit a location far away or find a new beach right down the street, you should be able to have an amazing time with your friends on the beach when the sun goes down. When you combine the cool nature of the ocean with the bonding experience of a camping trip you really end up with a situation that is extremely beneficial for everyone involved in the vacation.